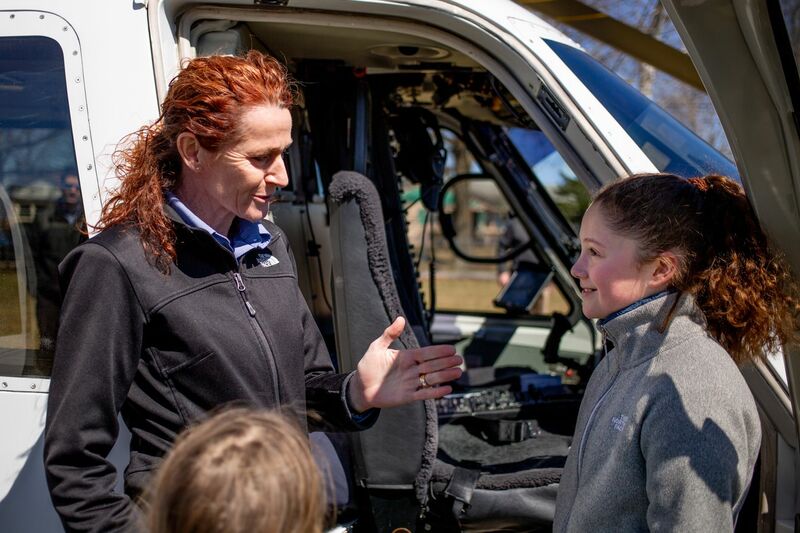 Pilot Kim Barwick shows Hailey Shapiro the inside of a Sikorsky helicopter after she landed it outside Phoenixville Area Middle School Saturday in a dramatic kickoff of the 19th annual Girls Exploring Tomorrow's Technology event. Inspiration came from the sky and made a soft landing on a field outside Phoenixville Area Middle School Saturday afternoon. More than 1,000 girls cheered as the Sikorsky helicopter piloted by Kim Barwick made a dramatic entrance to kick off the 19th annual Girls Exploring Tomorrow’s Technology, believed to be one of the oldest Science, Technology, Engineering, and Mathematics (STEM) events for girls in the country. A group of girls gathers as a Sikorsky helicopter -- piloted by a woman -- lands outside Phoenixville Area Middle School Saturday for a dramatic start of the 19th annual Girls Exploring Tomorrow’s Technology. This year’s free forum for girls in grades five through 10 included 85 activities in STEM fields, such as robotics, coding, video gaming, and forensic sciences, and a discussion involving more than 50 female senior executives form business, government, and education, including Vanguard, Cerner, Exelon, GlaxoSmithKline, Bentley Systems, Pfizer, and Children’s Hospital of Philadelphia. GETT, presented by the Chester County Economic Development Council through its Innovative Technology Action Group initiative, was first created as a response to the underrepresentation of young women in STEM careers. Earlier this month, TechGirlz, a Fort Washington nonprofit founded nearly 10 years ago to encourage middle school girls to consider STEM-related careers, was acquired by Illinois-based Creating IT Futures in hopes of creating a more robust pipeline of female IT workers nationwide. Also this month, the National Center for Science and Engineering Statistics released a report showing that although the number of women receiving a college degree in computer sciences increased between 1997 and 2016 — women are making up a smaller percentage of bachelor’s and doctorate recipients. Organizers of Saturday’s GETT event cited 500,000 open computing jobs in the U.S., with new ones being created at nearly four times the rate of other types of jobs.